In the six years since Nathan Perkel left Northern California for New York, he has produced a vast and successful body of personal and commercial photography imbued with a playfulness and energy that affirms the rapid success he has achieved in his field. His commissions have taken him into the bedrooms and closets of fashion kids such as Dylan Kawahara, associate designer at Opening Ceremony and blogger Leandra Medine, otherwise known as The Man Repeller. 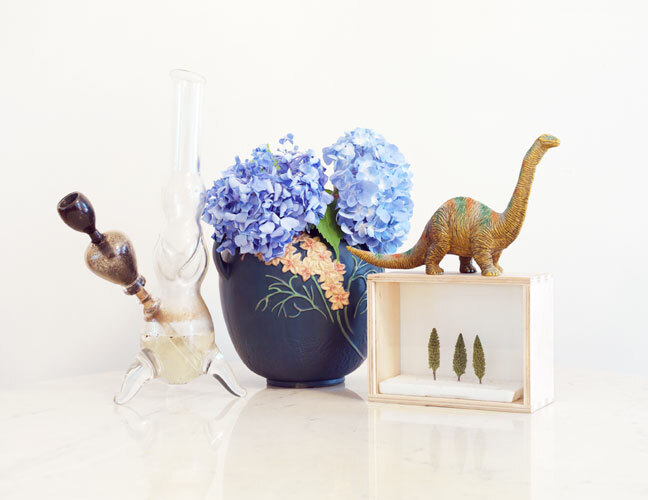 Perkel’s lens has animated and elevated their everyday objects, proving them worthy of their illustrious owners: bracelets, bongs and tiny toy dinosaurs radiate the eccentricity of their collectors and elbow for Perkel’s focus, angling to be brought to the attention of a larger public. Perkel is interested in photographing people above all else and his interest is so intense that these still lifes become convincing mirrors and extensions of their collectors, like a bionic part of the whole. Materialist commissioned Perkel to shoot his own most inspiring objects. Our writer Arianna Jacobs sat down with him over drinks near his East Village apartment to discuss the possessions that compel him to create. Do you have a certain object – the camera would be an obvious one – that epitomizes your personality? I can think of a bunch of them, for example this old blanket I pulled out two days ago to watch a movie in McCarren Park. It’s pretty awesome. It’s a felt blanket with images of Snoopy all over it. And I have all these trinkets because my father passed away when I was young. Every year my Mom pulls out this big box and it’s full of little things of his and she lets my sister and I take one of the things. It’s really cool. Also, skateboards are important. I collect all the boards I’ve ridden since I moved here. I have a stack. I’m thinking I will take them to a spot where people skate and give them away and photograph the kids I give them to. Are there any skate photographers you admire? There’s a bunch of people like Atiba Jefferson at the forefront of skate photography. When I grew up looking at skate magazines I always looked at Daniel Harold Sturt who would print his own photos. I was also inspired by Brian Gaberman, he would take this unconventional approach – doing platinum prints – this old method of photography and incorporating it into skate photos where it wasn’t used. Nowadays I don’t look at skate magazines much, but I definitely watch all the videos. Oliver Barton is another really good photographer. He’s from England, used a Hassleblad and brought European skate photos into America. With traditional photography, I also have so many influences and things I look at. Every week there’s another thing that I think might be some of the best stuff I’ve ever seen. What have you seen recently in terms of non-skate photography? There’s a book that’s been on my coffee table for the last month that I look at all the time, Atlanta by Michael Schmelling. He’s inspiring in the print aspect because he’s been so adamant about making books. He had access to southern rap culture, which at the time hadn’t been photographed as much. It’s this beautiful book of portraits of rappers and really niche things. Why did you decide to move to New York when you did? I graduated from school and was assisting a bunch of photographers in San Francisco and I set a date for myself. I always do this – set long-term goals. If I say to myself ’I want to move to this place in four years’, then you’re putting it together and if you have your eyes open to an idea – and that goes with anything – if you’re thinking about it, the opportunity will present itself. It’s when you’re not aware of what you’re trying for that it goes right by you. For the full interview, order your own copy of Materialist here.